Over 100 New Featurettes, New Commentaries, Enter The Matrix Videogame Footage and More! This holiday season, Warner Home Video (WHV) will give every fan of The Matrix movies what they want…more! More eye-opening revelations, more plugged-in discovery, more realms of bold possibility, as the trilogy that set a new standard in moviemaking now sets a new standard in DVD gift sets with The Ultimate Matrix Collection. 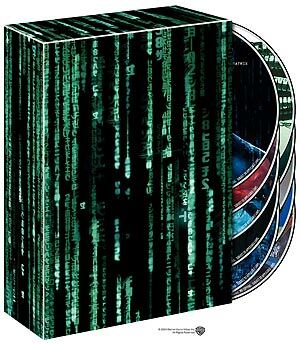 A spectacular ten-disc DVD set; The Ultimate Matrix Collection features all three films in the trilogy together for the first time ever with a newly remastered picture and sound for The Matrix. Also included is the companion piece The Matrix Revisited and the best-selling The Animatrix, plus five entirely new DVDs packed solid with brand-new special features that encompass every aspect of the Matrix universe, including two new audio commentaries on each film, Enter the Matrix videogame footage, over 100 deep-delving featurettes/ documentaries and much more! Debuting December 6, 2004 from WHV and Village Roadshow Pictures, The Ultimate Matrix Collection will be priced to own at £59.99 RRP. 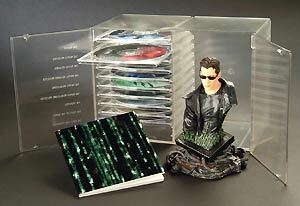 In addition, WHV will also present a special The Ultimate Matrix Collection Limited Edition which features the spectacular 10 extras-loaded DVD set, plus a limited-edition Neo mini-bust figurine and an 80-page Collector's Book. This exclusive edition will be priced at £79.99 RRP. Written and directed by the Wachowski Brothers and produced by Joel Silver, The Matrix Trilogy stars Keanu Reeves, Laurence Fishburne, Carrie-Anne Moss and Hugo Weaving. As one of the most successful science-fiction film franchises of all time, The Matrix Trilogy has grossed a staggering $1.6 billion dollars in worldwide box-office receipts to date. In addition to the films, the franchise has spawned successful companion DVDs (The Matrix Revisited, and The Animatrix), a best-selling videogame (Enter the Matrix) and is about to launch an online gaming component to further excite the highly popular franchise, look for information at www.thematrix.com. "This is the definitive DVD collection that Matrix fans have been waiting for! A pop-culture phenomenon that continues to break new ground, The Matrix has clearly become one of the most successful entertainment franchises of all time…and the demand from fans for more in the Matrix universe has never subsided," says Mark Horak, Executive Vice President, Warner Home Video. "An epic film series of this size deserves an unrivalled state-of-the-art DVD collection, and The Ultimate Matrix Collection will provide just that for fans worldwide." The Hard Problem: The Science Behind the Fiction documentary - Is the notion of a real Matrix plausible? An investigation of the technologies that inspire the metaphor of the Matrix. Profiles the "society" of craftspeople, actors and filmmakers who shaped the movie trilogy and the Enter the Matrix consol game in a full-length documentary. Follow the White Rabbit to 21 additional featurettes.